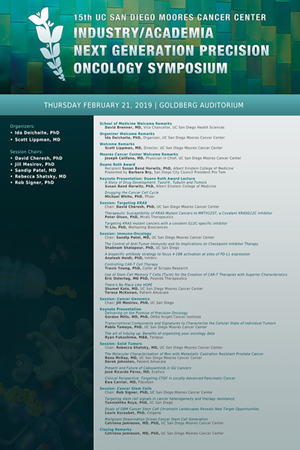 The 14th Moores Cancer Center Industry/Academia Translational Oncology Symposium was held on Thursday, February 22, 2018. See the Agenda here. Visit our Symposium page for more Symposium Featured Talks. Thank you to all that came and participated in the 2015 Symposium - we hope you enjoy the memories! San Diego ABC 10 News reporter Michael Chen interviewed San Diego resident Heather Clark, a patient of Moores Cancer Center, along with Ida Deichaite, Director of Industry Relations & Symposium Organizer, in a video report about the I-SPY Clinical Trial and Symposium. The I-SPY Clinical Trial is lead by Symposium Keynote Speaker and Principle Investigator Laura Esserman, MD, MBA. For the video, see below. Xconomy’s San Diego Life Sciences Roundup included Bob Klein’s Proposal presented at the Moores Cancer Center Symposium, outlining the $5 billion ballot initiative for funding California Institute for Regenerative Medicine in 2016. Xconomy's San Diego Life Sciences Roundup also included the Moores Cancer Center Symposium and Laura Esserman's acceptance of the Duane Roth Award. The San Diego Daily Transcript published an article about Dr. Esserman's acceptance of the Duane Roth Award and the Symposium. The San Diego Union Tribune wrote an article on the Symposium, namely the iSPY Trial and patient from the trial, San Diego Resident Heather Clark. Symposium Speaker Bob Klein was featured in a San Diego Union Tribune article, outlining the $5 billion ballot initiative for funding California Institute for Regenerative Medicine in 2016, presented at the Moores Cancer Center Symposium. San Diego ABC 10 News reporter Michael Chen interviewed San Diego resident Linda Lowe, a patient of Moores Cancer Center Investigator Dr. Catriona Jamieson, along with Moores Cancer Center Director of Industry Relations Ida Deichaite, PhD , in a video report from the 6PM News on April 11 covering the successful 9th Industry/Academia Translational Oncology Symposium.